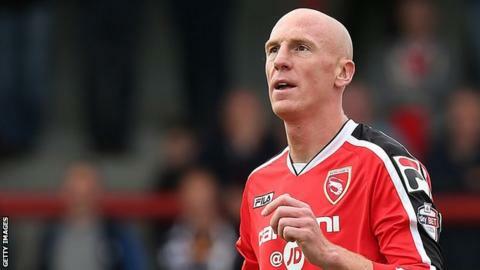 Morecambe eased to victory over 10-man Luton, who dropped out of the automatic promotion spots in League Two. Jamie Devitt's cross found Alex Kenyon, who nodded back across goal for Kevin Ellison to put the home side in front. Luton defender Steve McNulty was sent off for two bookings before half-time. Mark Hughes headed in Shaun Beeley's cross for 2-0 and visiting goalkeeper Mark Tyler denied Ellison his second before Padraig Amond sealed a comfortable win from six yards. The Shrimps can now claim ownership of the Eric Morecambe Trophy, a prize created to celebrate the restoration of a statue of the television star in Morecambe. The comedian, who died in 1984, was born in the Lancashire town from which he took his stage name, while Luton was his favourite team. "Whatever we spoke about before the game, however we planned it out, people weren't up for doing that today. "We have defended magnificently this year, but we've had a poor day. "We're going to get beat, we all get beat, I'm not worried about that. It's about how you get beat and today we got beat because we were too poor defensively. "I can't think of a defender who defended well enough, perhaps Nathan Doyle, but other than him defensively we were not at it." Match ends, Morecambe 3, Luton Town 0. Second Half ends, Morecambe 3, Luton Town 0. Attempt saved. Ross Lafayette (Luton Town) header from the centre of the box is saved in the top centre of the goal. Corner, Luton Town. Conceded by Mark Hughes. Attempt saved. Ricky Miller (Luton Town) left footed shot from the left side of the box is saved in the bottom right corner. Foul by Andy Parrish (Morecambe). Ricky Miller (Luton Town) wins a free kick in the attacking half. Attempt missed. Jake Howells (Luton Town) left footed shot from outside the box is high and wide to the left. Stewart Drummond (Morecambe) wins a free kick in the attacking half. Foul by Ricky Miller (Luton Town). Ross Lafayette (Luton Town) is shown the yellow card. Kevin Ellison (Morecambe) is shown the yellow card. Foul by Ross Lafayette (Luton Town). Foul by Stewart Drummond (Morecambe). Nathan Doyle (Luton Town) wins a free kick in the defensive half. Goal! Morecambe 3, Luton Town 0. Padraig Amond (Morecambe) right footed shot from the centre of the box to the top right corner. Corner, Morecambe. Conceded by Alex Lacey. Attempt blocked. Padraig Amond (Morecambe) right footed shot from the centre of the box is blocked. Attempt saved. Kevin Ellison (Morecambe) left footed shot from the left side of the box is saved in the bottom right corner. Corner, Luton Town. Conceded by Laurence Wilson. Kevin Ellison (Morecambe) wins a free kick in the attacking half. Foul by Luke Wilkinson (Luton Town). Foul by Jamie Devitt (Morecambe). Shaun Whalley (Luton Town) wins a free kick on the left wing. Attempt saved. Jamie Devitt (Morecambe) right footed shot from outside the box is saved in the bottom right corner. Substitution, Luton Town. Ricky Miller replaces Michael Harriman. Attempt missed. Jamie Devitt (Morecambe) left footed shot from the left side of the box is close, but misses the top right corner. Attempt saved. Kevin Ellison (Morecambe) right footed shot from the right side of the box is saved in the top left corner. Attempt saved. Laurence Wilson (Morecambe) right footed shot from outside the box is saved in the top centre of the goal. Hand ball by Luke Wilkinson (Luton Town). Jamie Devitt (Morecambe) wins a free kick on the right wing. Foul by Fraser Franks (Luton Town). Substitution, Luton Town. Ross Lafayette replaces Mark Cullen. Attempt saved. Kevin Ellison (Morecambe) right footed shot from the centre of the box is saved in the centre of the goal. Foul by Alex Kenyon (Morecambe). Shaun Whalley (Luton Town) wins a free kick in the attacking half. Substitution, Morecambe. Padraig Amond replaces Paul Mullin. Attempt missed. Jake Howells (Luton Town) header from the centre of the box is close, but misses the top left corner.